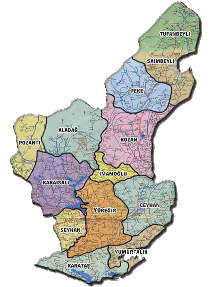 Adana is the fourth biggest province in Turkey based on the year 2000 numbers, with a population of 1.8 million. Adana is located on the east of Tarsus in southern Turkey, in the Mediterrenean Region. The province borders the Mediterrenean sea, but the city center is as a 50km distance from the sea. River Seyhan, passing through Adana, makes the region (Cukurova) very fertile. Cukurova is the largest plain in Turkey, and it is formed by the soil carried by the River Seyhan and the River Ceyhan from the Taurus mountains in many thousands of years. Seyhan and Yuregir are the capital cities of the province. The central part of the province consists of the old city of Adana and the new Adana which shows the fast growing pace of the city. Production of cotton is very important for the economy of the province, and the main industry is textile. There is a big train station in the city center and an airport close to the center. In adition to these, the Incirlik Air Base of NATO lies about 12km east of the central Adana. Adana province consists of 13 cities. These are Aladag, Ceyhan, Feke, Imamoglu, Karaisali, Karatas, Kozan, Pozanti, Saimbeyli, Seyhan, Tufanbeyli and Yumur. Some significant sites in Adana are Adana Archeological Museum, Hasan Aga Mosque, Magarsus Church, Tas Kopru (A roman stone bridge over River Seyhan), Ulu Camii and Eski Camii. | | @@XTV8Z | 1 | 1´" | Adana Ataturk Parki | Adana Cukurova University - Cukurova Universitesi | Adana Lake Seyhan - Seyhan Baraj Golu | Adana Merkez Parki | Adana River Seyhan - Seyhan Nehri | Adana Sabanci Mosque - Sabanci Merkez Camii | Adana Stone Bridge - Taskopru | JyI= | Mr. | Mr. | Mr. | Mr.